Our first ROS Summer School in 2012 showed that a lot of students are interested in mobile autonomous systems, but do not know how to start. Our ROS Summer Schools provide the right starter kit by using our robotic hardware and - of course - ROS software. We first start with some days of introductory courses, before we tackle the main tasks of mobile robotics, i.e. perception, localization, mapping and path planning. Our philosophy is: "Learning by doing to get hands-on experience". Besides acquiring the necessary theorethical knowlegde, all topics will be taught in small groups on real mobile robots. A highlight is a competition (urban challenge) at the end of the summer school: Participants form different teams that have the task to design a typical mobile robotic application like indoor/outdoor exploration. They all use the same hardware, powered by their learnt ROS skills. The ROS Summer School includes also some leasure activities, such as trips to Paris and Cologne (or other nearby cities). Last, but not least we have a farewell barbecue at the end. There has been remarkable progress in the field of mobile robotics over the last couple of years due to advanced hardware like 3D sensors and powerful embedded systems for processing. However, the software has been upgraded as well: When Willow Garage launched the first version of ROS (Robot Operating System) in 2010; they started a standardization of the "middleware", which drives the world of mobile robotics. ROS is open source and offers the required services of an operating system. It is fine grained and consists of numerous reusable modules. It also provides tools and libraries for obtaining, building, writing, and running code across multiple computers with a powerful communication engine. The course is taught in English. Here is our ROS 2019 flyer for download. The next Robot Operating System Summer School (ROS 2019) will take place from August 12th- 23rd, 2019 (here is our ROS 2019 flyer for download). The participants will use the Middleware ROS (Robot Operating System) as Operating System for Robots. 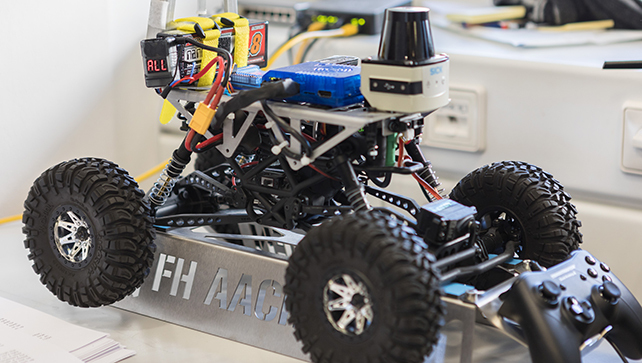 Alongside learning the theory, all topics will be experienced in small groups on real hardware using our mobile robots developed at the FH Aachen. In end the participants will apply their acquired knowledge to solve a secret problem and show their results in a competition. Additionally, we offer excursions during the week to explore Aachen and other nearby cities (e.g. Cologne, Maastricht or Bonn). Optionally, we offer an UAV workshop on Saturday/Sunday (August 24-25th, 2019). Please refer to the section "Additional ROS-based UAV workshop" below for further information. Please note that program contents can be subject to changes. Please refer also to the sections "Impressions, Videos, and Press Releases" (right down here of our ROS homepage) to get an idea of what we have done in previous ROS Summer Schools. We want summer school participants to make significant, noticeable progress in learning and applying ROS. Therefore the practical sessions are going to take most the time of the Summer School. Basic knowledge in C++ or Python is recommended to complete the practical sessions successfully. Experience with ROS or Linux is not required. Participants should have a good proficiency in English as the ROS Summer School is held completely in English. The Aachen University of Applied Sciences (FH Aachen) requires that the ROS Summer School participants have appropriate and valid medical, liability and accident insurance for the duration of the ROS Summer School. Please note that the FH Aachen does not cover any of these risks. According to German data privacy laws, you must agree to the following statement before we can post your picture, even in a group photo, on the internet. The ROS Summer School registration fee is 750 Euro and includes beverages during the course at the FH Aachen and the social program (excursions included). Please note that your application is only valid after timely payment. The application procedure is explained on the application form. If after registering you are unable to attend the summer school, or if you cancel your registration, you may request a refund of your registration fee. You need to send us a written request via email. Please be aware that payment can be made by bank transfer only. All payments are in EURO. For any bank transfer made from outside the Euro zone, please be aware of bank service charges. All bank charges for remittances are to be borne by the participant! Accommodation and catering costs are not included in the participation fee. The registration fee includes only beverages during the course at the FH Aachen University of Applied Sciences. A participation certificate is issued for all ROS Summer School students and handed out at the end of the summer school. The certificate lists the topics covered, the duration of the summer school and the course credit (4 ECTS credits). The course credit applies not for internal ROS students (FH students, who are involved as ROS tutors). UAV is short for unmanned, uninhabited oder unpiloted aerial vehicle. We offer an optional post-summer-school ROS-based UAV workshop on Saturday/Sunday (August 24-25th 2019). If you intend to take part in the additional ROS-based UAV workshop, please note that you have to add the workshop fee of 200 Euro to the registration fee. The workshop fee of 200 Euro includes the fee for beverages and lunch. Please note that we can only offer a limited number of seats for the UAV Workshop. Those who would like to take part in the UAV workshop are requested to tick "YES" on the application form (see question: Will you attend the post-summer-school ROS-based UAV workshop?) for better planning. Please note that the costs for the UAV workshop have to be paid in advance. Please refer to the sections Registration Fee and Other Costs (see above) for more information. Internal applicants (FH Aachen students) who want to apply for the ROS Summer School 2019 are asked to use the Campus System for registration. External applicants (national or international applicants) are asked to use our application form. Application deadline: June 30th, 2019.